This package is ideally suited for brand new or vehicles with less than a 1000 miles on the clock that don't require paint correction prior to ceramic paint protection application. 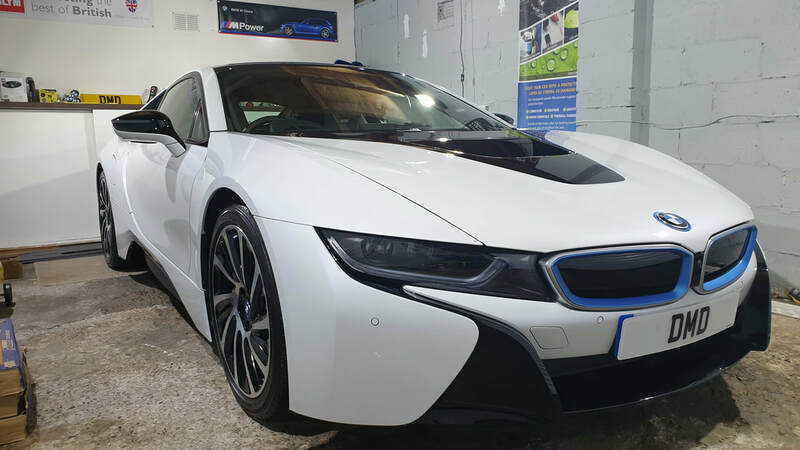 BMW i8 after my New Car Detail and application of Ceramic Coating. Ceramic Coating package's for Used / pre owned vehicles will remove light swirl marks, dull and hazy paintwork that has been damaged by poor wash techniques over the years. These package's are ideally suited for used or pre owned cars that are new to your ownership with more than a 1000 miles on the clock that do require paint correction prior to ceramic paint protection application. With the Stage One Detail your vehicle will benefit from a thorough deep clean and decontamination before a single stage machine polish is carried out. Once the wash stages are complete the paint is fully decontaminated from tar, iron deposits, tree sap, bugs etc, Clay barred and treated to a single stage machine polish to remove light swirl marks, minor paint imperfections, marring and resulting in adding gloss and depth to the paint before applying the 9H Ceramic Coating. Jaguar XJ after my Stage One Detail and application of Ceramic Coating. A Stage Two Detail is designed for used vehicles that are heavily swirled and scratched from poor wash techniques, automatic car washes and being driven daily. All of the above conditions leave your vehicle not looking its best with no depth of colour and looking dull. The two stage machine polishing detail will consist of two machine polishing stages, the first stage is a cutting stage to remove the worst of the swirls, scratches and imperfections hiding the true colour of your vehicle. The second stage is a refining stage to remove any marks left behind from the first stage and at the same time increasing the gloss levels and clarity of your paintwork. After the machine polishing is complete 9H Ceramic Coating is applied to ensure that your vehicle's paintwork is protected for years to come. Volkswagen Golf R after my Stage Two Detail and application of Ceramic Coating. The 9H ceramic coating service gives you convenience to easy clean your vehicle with no regular waxing/polishing. Damaging elements like tar, bird droppings, tree sap, bug splatter, acid rain etc. Minor scratches and swirl marks caused by washing. The 9H Ceramic Coating brings out the colour of the paint and enhances overall shine and gloss. Plastic trim’s colour will be enriched. Chrome finishes will take on a mirror like shine. Cleaning your vehicle becomes much easier, even stubborn dirt like tar and bug splatter can be removed easily. No need to wax or polish your vehicle, simply wash it for a showroom shine. Vehicle will stay cleaner for longer. Knowing that the vehicle’s exterior is protected against the elements. The easy cleaning surface created by the 9H Ceramic Coating, minimises the risk of scratches caused trying to get stubborn dirt off. Reducing the need to have the vehicle detailed or polished. Less chance of having to spend money on paint correction due to the ultra hard transparent glass film. ​The Ceramic Paint Protection DMD Detailing use will outlast any dealership coating & protect the clear coat and base colour from ultra violet rays and acid rains, preventing them from degradation and colour fading. The painted surface will continue to look glossy years later. Besides that, dirt, road film etc find it difficult to get stuck on the surface compared to a carnauba wax due to the super hydrophobicity of the ceramic coated surface.